It wasn't long before I began to get the feeling that this game simply dislikes its players. Early levels feature enemies that are highly resistant to all but one or two types of damage, so players who have been unlucky with the random loot system will have to go back, grind, and hope for better luck. The scenery actively gets in the way as much as possible, with trees and branches obscuring the view no matter which way you turn the camera. 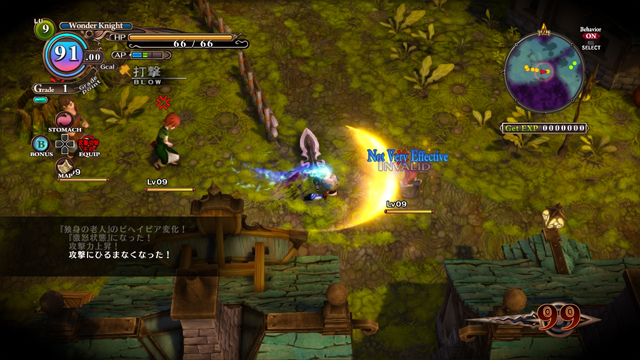 Even the stamina meter that floats around the Hundred Knight can obscure enemy attack tells. Dubiously helpful text flies rapidly out from the battles. What does “Blunt!” mean? Is this guy doing blunt damage? Is he vulnerable to blunt? Should I smoke a blunt? The ever-mocking load screen instructions fail to illuminate. This is NIS, though, so at least the story should be amusing, right? Unfortunately, no. Unlike the company's humorous “bad guy” heroes such as Laharl, Etna, and Overlord Zetta, Metallia is just straight-up mean and nasty. Other than her supposedly-loyal butler, who has a few mildly amusing moments, the rest of the cast fails to make much of an impression. There's no real satire or silly humor here, just attempts to shock that end up being generally offensive to humanity. If you don't find sexual assault to be a laughing matter, for example, the game will lose you early on. Frankly, it all just made me angry. The cute creepy-pop soundtrack that is Nippon Ichi's calling card doesn't help here, setting the mood for lighthearted wickedness when nothing of the sort is happening on-screen. The voice actors do a fine job with the material they've been given, there's just not a lot they could have done to save the script. Frankly, Nippon Ichi is better than this. If the company hopes to continue making action RPGs, it needs to learn the KISS (Keep It Simple, Stupid) principle. I enjoy complexity as much as the next gamer (or perhaps more than, being an RPG fan), but this was the wrong kind of complexity for the wrong kind of game. As for the painfully unfunny story and characters, I'm just going to hope they aren't a sign of things to come. 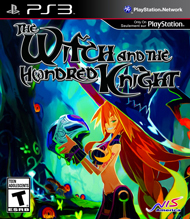 Everybody takes a swing that misses sometimes, and The Witch and the Hundred Knight is a big old strikeout. They're just all right, and the scenery actively hates the player. Needlessly overcomplicated additions tied to an overly simple combo system and hampered by Gigacals. The poppy/creepy music and comedic voice acting that work so well for Disgaea feels out of place here. This game is muddled systemically and its storyline is generally offensive to humanity. Saving the world doesn't have to be the world of a saint! Players can choose whether they want to save the innocent or take part in looting and pillaging. On the quest to defeat the Forest Witch and restore peace and stability, be as good and virtuous or brutal and evil as you wish! As players progress through this colorful, accessible isometric action RPG, they'll come across an assortment of NPCs that can, using sophisticated AI, react differently to the player based on the decisions and actions taken. Being good or bad has real consequences! From the team responsible for one of the most popular Japanese role- playing game series of all time (including lead designer Takehito Harada), The Witch and the Hundred Knights is a laugh-out-loud fantasy adventure full of mischievous characters and exciting environments.